Anandabazar Sharadia 1423 (2016) Bangla Magazine PDF file. 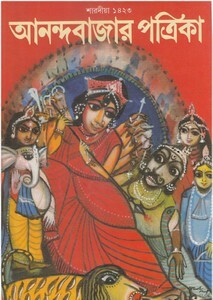 Sharadia 1423 Anandabazar Patrika is a individual edition for upcoming Bangali Durga Puja festival. The Yearly magazine has been published every year before the fastival and publish by largest Bengali Newspaper agency Anandabazar Patrika from Kolkata in India. This edition cover story are alot collection of novels which are written by various prominent authors, Myths- Malyaban and Pushpadanti, stories, poem, travel etc.